Alva Bradley hired Emmet S. Palmer and Lucien P. Hall to design his three-story Romanesque Revival double townhouse built of brick with brownstone trim, gables, roof dormers with finials, half towers, arched windows, and several porches. Palmer and Hall designed many schools in Duluth, including the city’s grand 1892 Central High School. Bradley, born in Ohio in 1849, came to Duluth in 1882 after spending many years in the lumber business in Newark, Ohio. In the Zenith City, he joined his father Henry’s firm, the Bradley-Hanford Lumber Company. They were wholesalers: they did not own any yards or mills. 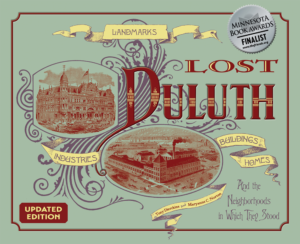 The Bradleys and several relatives lived in the townhouses until he left Duluth for Denver, Colorado, in 1908. The following year the Bradley townhouses were divided into apartments and furnished rooms. It served as an apartment house until 1968 when it was demolished. The site is now part of a parking lot for San Marco Apartments.